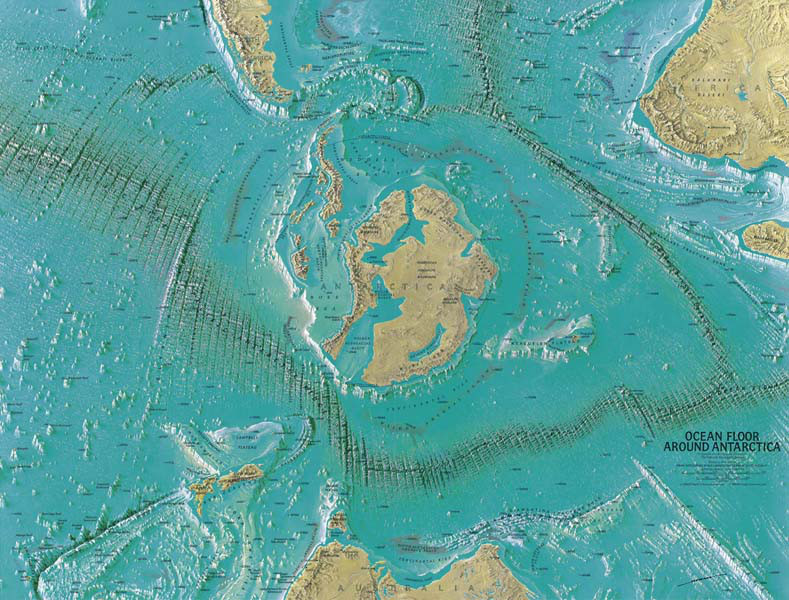 Do these maps prove the existence of the Hollow Earth? One of the most interesting question many people have asked for centuries is whether there is a possibility that our planet is hollow? For many years it was believed that the earth was hollow, but even though many have come up with theories, until 1968 there was no proof. That year, pictures taken by a satellite orbiting Earth clearly showed a gaping hole located at the North Pole; enough evidence to support the Hollow Earth theory according to many. 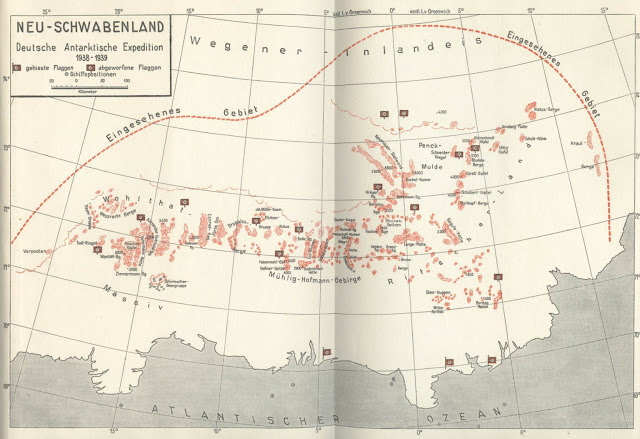 Map made ​​by Heinrich C. Berann for the National Geographic Society in 1966. Apparently showing the entrance to Inner Earth. More info about U-Boat 209 can be found by clicking here. 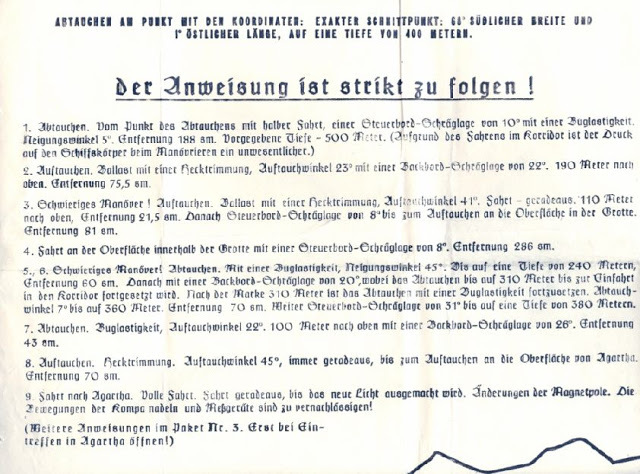 Editors note: Added letter from Karl Unger in English. Citation needed. Entrance Hollow Earth filmed by NASA Space Shuttle STS-80 back in 1996..? From the Sacred Mountain of Mt. Shasta, to the very core of the Earth comes the messages for humankind… We Are Not Alone! 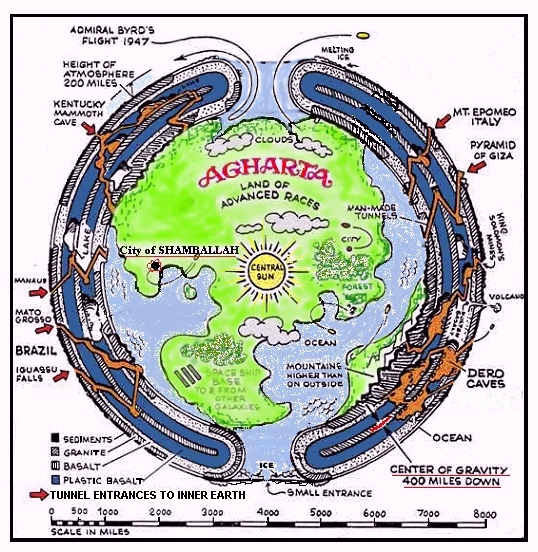 ‘Spaceport Inside Hollow Earth…’ through Dianne Robbins, March 21, 2015.
and to the other 120 Subterranean Cities located a few miles beneath the Earth’s crust, called the Agartha Network. 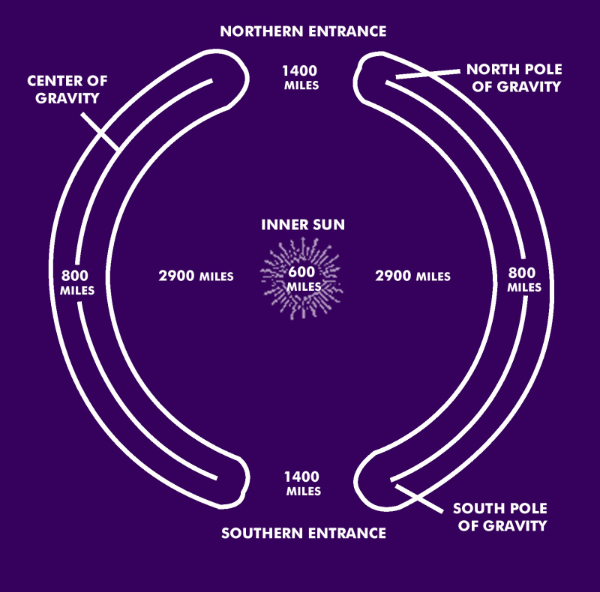 Our Spaceport is located inside the Hollow Earth, in direct alignment with the openings at the North and South Poles. We are not stuck on the Earth as you are, but can leave whenever we desire. We are not limited in movement, and can travel throughout the Universe at will. There are no physical constraints, for we apply the Universal Laws of Energy and use the already existing highways throughout the Universe. We can’t get lost, for all is mapped out and all is in constant communication with all in existence. We just tap into this “live” network that is always broadcasting and move through it effortlessly. As we are here in the Center of Earth’s interior, you are here with us in consciousness. For consciousness is a “place”—a place more solid than your physical places. So yes, you sit on the surface at your desk taking this dictation, but in consciousness you are with us inside the Hollow Earth. You are literally in two places at once. Do you understand multidimensionality now? Now that you are in both places simultaneously, we will show you around “our place”. As you scan our landscape, you will “see” the openings of the Holes at the Poles. These openings are wide enough for some Mother Ships to enter. You can “see” the Spaceport, spread out for hundreds of miles in a circle interspersed with flowers, grasses, bushes, trees, and waterfalls. It does not look like your barren, concrete airports, devoid of life; but rather like a garden with space shuttles and starships nestled peacefully inside our world. We hardly know when they come and go, as they do not emit any harsh sounds, and we hardly detect any sound when they land or take off. They are in complete harmony with our love vibration and move in silence. We can visually see their movements as they gracefully fly in and out through the Poles. But this is the extent of it. There is no disturbance in sound or vibration, and there is no pollution and no destruction of our environment. This is quite a contrast from your surface airports, isn’t it? And, we never have “crashes”, since every component of our craft is monitored by our amino-acid computers, and we detect and correct any problem immediately. Our technology is far advanced from yours, for we’ve had the opportunity of peaceful living conditions to continuously develop it for millennia, without a break in our life spans. This is why your Immortality is so crucial. The longer you live in the same body, the more you can develop your talents and technologies, and the more you can create and refine things, rather than stopping and starting over again in each succeeding lifetime. All this stopping and starting over and over again gets you nowhere. You are continuously “reinventing the wheel”, and never moving beyond it. It is stagnation in evolution, getting you nowhere. This is all ended now, as Mother/Father God of this Universe has sent an edict that Earth has to move on, and can no longer hold the rest of the Galaxy back. All the other planets in your Solar System have already ascended, and it is only Earth that the whole Milky Way Galaxy has been waiting for. The laggards won’t be able to hold Earth back any longer. From now on, all laggards will incarnate on an isolated planet where they won’t be allowed to interfere with the evolution of a species, planet, Galaxy, or Universe again. This is the edict that has been handed down from our Great Central Sun, Alpha and Omega. The four of us involved in this event have all reviewed this write up of what we saw and agree that this write up is what we saw took place. When Nancy Tate and I, Bob Towers lived in Mt Shasta from the Fall of 2011 to end of July 2012 we had a surprise visit from Adama. In early July 2012 Peter Olson, and Anakhanda Mushaba were visiting us at our home. One morning we all decided to go to Weed, CA to have breakfast at the HiLo Cafe where Nancy, Peter and I had eaten there many times. HiLo Cafe was about 5 miles away from our home. Upon arriving at the HiLo we were seated at a round table located in the front of the cafe in the corner the farthest from the front door as you walk in. Nancy was seated in a direction that allowed her to see in the direction of the front door of HiLo. At some point Nancy saw a very, very tall man outside the front door, and as he came in he had to bend down to miss the top of the door frame with his head. We all turned to look at him as he came into the cafe. He was taller than any basketball player we have ever seen. We estimate his height at nearly 8′. His hair is hard to describe but it had a certain glow or beauty to it. His clothes were quite simple, neat but nondescript. He sat down on one of the stools at the counter not too far from our table and view. I think we were all dumbfounded at what we were seeing at that moment and we all turned to look at each other and we all seemed to say to each other, “Could this be Adama”? Then in a few seconds we all looked back toward where this man was sitting, but he was not there. This was even more puzzling because none of us saw him leave the cafe. I thought maybe he went into the restroom, so I got up and went there to see. He was not in the restroom. As I came back toward the table Peter took the photograph (above) just as I reached the stool the man had been sitting on. When Peter showed us the picture we could not believe our eyes because, as you see in the photograph, there is a globe of light right where he had been sitting. What is really interesting is we were told that when we went to live in Mt Shasta we might have a encounter with Adama, and this did come to pass. If we all had not been in such a shock when we first saw him sit down we would have tried to ask him something. This whole episode only lasted just minutes in our recollection of this event. This is Nancy, and as I was finishing this page to post on the ‘Tree’, I felt Adama’s presence, so I tuned in and here below is what I received. It is time for you all to give yourselves the knowledge on a conscious level that you are about 75% awake, on average, and in the coming times you will find that there will be events in your minds and in your outer world that will tell you that it is no longer a matter of waking up to who you are. It will be all over the media and the planet’s surface that we do exist, and that there is life beyond this planet and all through the universe. There are very exciting things under way. We know that some of you became disinterested in the process of Ascension when it didn’t happen as fast as you thought it would, but the energies continued to flow across the planet to all of you, you continue to be awakened to your own talents and abilities and to the need for you to serve your fellows as this work continues. Many of you have listened to Zorra of Hollow Earth this week, and heard his pronouncements about what is coming for all of you. It is true that the coming month is going to be a blockbuster, as you would call it. May 25th will bring the lunar eclipse which will begin another flow of energy which will surpass the December 2012 energies which caused so many to have headaches and Ascensionitis, as we called it then. This will be more powerful than that. Those of you who are awake will feel the rising tide so strongly that you will feel you are being lifted off your feet. Remember the feeling that some of you described as the sensation of dropping fast in an elevator, or the odd whirly feelings you get when you have jet lag? You absorbed those energies already, and you will now take another step upward in the vibrations you can absorb. You have acclimated well to the rising tide and are ready for the next shift. Others who complained and suffered illnesses during the last round will probably feel difficulties this time as well, but you will be better able to explain to them and encourage them to meditate, concentrate on deep breathing, adjusting and opening their chakras, and relaxing into it in order to ride it out. All of the month of June will offer you intense rising energies which are designed to lift all the people of planet Earth to the next level of 5th dimensional experience. Little by little, you are accommodating to the new energies and the new life it requires. All around you, more people are awakening, looking around them and realizing there is something wrong with the life they have lived, something wrong with the way your world is organized. They are noticing the cruel practices and violent ways and questioning why it has to be this way. More and more people are fervently envisioning peace, an end to the suffering and poverty caused by war, and an end to the stranglehold of powerbrokers who control the flow of money and use it to enslave whole countries. The Citizens’ Hearings for Disclosure brought real results. There was in attendance a representative from the U.N., who understood that the Disclosure process could not be left to any one person or country, but must be proposed to the entire General Assembly, as was suggested in the Hearings. A plan was hatched: the proposal will be to designate a day of meditation to invite the Galactics to come forward, to show themselves to us. It was well understood in the meetings that there is nothing to fear – many countries have already acknowledged that – and that the problem has been the policy of secrecy and cover-up, especially in the U.S.
Now, all of you can have a powerful effect on the outcome of these continuing efforts. Remember our request that you create another Harmonic Convergence? Now is your chance. It is very important that you begin by sending your group envisioning power to the members of the General Assembly of the U.N. Here is what we propose: Use the handy numbers 11:11 and 12:12 as your rallying times, so that at least twice a day all across the globe, people will be sending the strong suggestion to the representatives who will be asked to vote on this proposal that they enthusiastically support it and vote “Yes” to naming a Day of Meditation to Welcome the Galactics – soon! Picture the gathering, the representatives smiling at one another, the lifting of hearts, and the positive sense of anticipation and joy at joining together to make such a thing possible. Begin as soon as you read this message. It will be your work – all of you who read this message, and there are many thousands of you – to join together to accomplish the first phase of this project. Your previous meditation was effective; it spawned the hopeful idea in so many people that the Galactics are indeed friendly. Now, take the next step. Make it your purpose to join in placing the psychic “bomb” under the behinds, as you might say, of the U.N. members. Blast them out of their seats, to clap and cheer for the proposal, and it will be done. The following phase will be for all of you to pass the word to everyone you know to publicize the date of the Meditation Day and to keep the attention building. So you see, you will have an ongoing job to meditate each day twice to create the monumental force which will carry the movement forward. It may take some time – you know how large organizations move – but your persistence will create the sense of urgency to make it happen, at each step of the way. You have gathered here to read these messages as a group, expanding your numbers with each passing week. There are now enough of you – some 10,000 strong – to create a Harmonic Convergence of your own, if you put your minds and hearts to it. Do not underestimate the power you possess as a living organism of Light, capable of changing the course of the world with the energy of your group mind in action. This project will indeed test your patience and your resolve. We ask that you begin now and that you continue to meditate twice a day for 5 or ten minutes with all the intensity you can muster, for as long as it takes. Begin with the U.N. members, then later with spreading the word with your actions and continued meditations each day. In this way you will keep the energy focused on the process with such intensity that it will be impossible for your intention to be ignored. With the increased energies flowing across your dear planet, your intentions will be carried on the flow of Light and Love to every corner of the world, and others will begin to envision the celebration and joy of greeting their brothers and sisters and Twin Flames who will arrive on the ships. Many of you have written to Kathryn or called in to the radio show to ask what your path is, what you can do to be of service. You were unsure of how to proceed, but sensed that you have an important mission here at this time. Well, here it is. Do your part to change the world. Do not underestimate for a moment the power you have as an individual to change the world by the force of your intention. And do not underestimate the power of all of you together! What a wonderful thing it is, to have this internet which can act as a lightning rod to send the message of peace and Light to every corner of the world! We did not have this simple means of communicating in 1987, and yet it was possible for the people involved in the Harmonic Convergence to create such an energy flow on their own that they were able to create a wave which was recorded by the scientific instruments at the time, and it is still felt to this day. This time you will have more help and more convenient tools to make it happen. This request is a test of your Faith. Are you serious about making your contribution to this historic Shift, or will you wait to see if it works before you are willing to believe in the power of Intention? Will you work with the Universal Law as we have explained it to you, or will you sit back and watch to see what others accomplish before you will make the effort to put your shoulder to the wheel? Some will scoff and say, “I’ll believe it when I see the ships land.” Well, of course any fool will believe it when the ships land, no matter how blind they may have been previously. So, Dear Ones, here is your chance to make your stand, between you and yourself, between you and your God. Will you cast you fate with Us, and put your energies where they matter? Will you create the peace and prosperity you have been demanding of Us? Reach deeply into your hearts; join mind and heart to create a force of Love and Light such as has never been felt before on the planet. We will be sending the energies to help carry your Intentions to fruition. We are creating the conditions to make the Dream of Dreams possible. All the Masters and Guides are working overtime to help create the conditions on the ground which will allow you to ride the rising tide to victory. With your help we have assembled the most powerful team in the history of the planet. Now we need for you to carry the ball to the goal line. You are our great hope. We love you more than words can ever describe. Greetings beloved brethren of Earth. It has been a while since our last connection and as always we are most delighted to step forward in the Now and to convey a message of Love and Light. As is commonly known, the current eclipses contribute a lot and are really the trigger for everything that is now taking place on Earth. Shifts continue to occur and they go hand in hand with an inner cleansing, with transmutations and transformations which have become a daily routine for your Being. You better get used to it for a lot more is waiting in the wings as transformation is an unending process of Ascension which will continue to happen no matter what state of consciousness you have accrued. As to your transformation, you are never really completely finished with it because you are an energy and energy moves and changes shapes and essences indefinitely depending on what your energy adopts, creates and chooses. Therefore the process of transformation and transmutation goes along phases to lead you from one point to the next, as you always evolve infinitely into something else. That is life, that is Being. The reason why we wish to step forward today is to give you the next update about the current state of affairs in Agartha, in Telos and in all civilizations of the Inner Earth. Our civilizations mutually forge deep ties in order to guarantee increased cooperation for Gaia and for all Her lightbeings and by the latter we mean all of you. We too are evolving more and more into a collective and consciously aware civilization that wishes nothing else than Love, a civilization that is only motivated by Love. That is also the objective which all of you strive for : 1 collective conscious awareness and Being. We are going to assist you with this together with all the other collective groups in the cosmos, which you call the Galactic Federation of the Light. As we have mentioned before, we also cooperate closely with the Pleiadian and with the Sirian Emissaries of the Light. We now would like to give you a few names of civilizations tightly involved in galactic projects, amongst which is the Disclosure project and other important projects on Earth. Méline is involved but so are countless other souls in incarnation who are in the know. It is our deepest desire that humanity becomes knowledgeable of the facts that certain entities are eligible to bring forth great things officiating a trust and an unmistakable perseverance, what is now of the utmost importance. · The Mondrians and their civilization called Mondrianon. They bring the spiritual enrichment of light, they come from another Universe but do have a connection with the Pleiades. · Luminianon, a civilization of the high Light originating from the Andromedan Galaxy (Luminians) They bring high technology into force on your planet. · The civilization of the high Light of Orion; the Orion council of Light. There are few civilizations that are not of the Light, but this one is. · The galaxy of Ontheon. Located near the Rorst Universe. They bring inassets through portals which include “Sason”: a high-tech equipment that isincredibly valuable energy. This equipment provides a better environment, for example to remove Chemtrails. · The Suprianons, a civilization of the Galaxy of Nebadon (our Universe)They want to connect with us, they are from the light and highly developed(9D), they wish to make contact soon. · The Litheans, a civilization of a very distant star system called Lithiamos. They provide better conditions for the Earth, like always feeling good. By and large, this list comprises the major cooperation groups working with all of you incarnated on Earth. 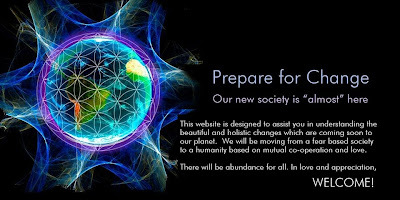 Be aware that all the groups mentioned above stand for Presences of the Light having each their specific goal and essence, contributing their part in this global, solar and even universal process of Ascension. The cooperation takes place in everyone of your consciousnesses and in your Being of essence, meaning that each and everyone of you is a part of all these energetic Presences, these groups and this cooperation. You are the aspects of each essence in incarnation and you bring everything further along in manifestation by grounding all those refined energies that you are and that you receive from us; all of us forming 1 giant cooperation. Each of you has the full integration of 22 Galactic galaxies in your entire DNA, which means that there is a connection to each galaxy. Can you see now that you are the ones that will bring everything further along with a little help from us?! You use your embodiments and your Being to bring all of this into your reality by integrating, creating and grounding it all. We provide you with the energetic force, with enlightenment and with guidance which afterwards you integrate, become aware of, know of and which you convert into reality. All of us are you in aspects of Being, your are a part of all of us whether we refer to Agarthans or to the Pleiadian Emissaries of the Light, or to Vega or to Andromeda. It doesn’t matter as we all form 1 giant group consisting of subgroups, shaping their own specific colour, consciousness and identity. We observe lots of events and shifts happening in your Earthly reality and it becomes clearer to many Earth brethren that it gets ever more difficult to maintain duality. This leads many people to disillusionment but also to dispair, to the feeling of being lost. The reality that was steadfastly prevalent for so many centuries disintegrates and leaves altogether, as viewed from your stance and from that of everyone now present on Earth. One person will arrive at certain insights quicker than another and one process will evolve more smoothly than another but rest assured that everything evolves as you create it according to what is at present the best way for you to learn from. Currently we see many lost souls trying to find their way to their own truth, in search of a certain hold that offers comfort. However, this hold is illusory because everything changes eternally and one has to be flexible and open to everything that comes one’s way, whatever that might be. As long as you stay in a positive energy, positive circumstances will be experienced by you. Be powerful and clear in your thoughts/creations in a positive way and always from the heart in the purest of Love. Gradually we are becoming your reality because you dwell in a higher reality that allows for the merger with our energies. Be patient, let go of the notion of time as this still is prominently the obstacle holding you back : time! We advise you to rather live from day to day as if everything is in the Now and there is no tomorrow, there is no yesterday; all is Now. With lots of Love and in heartfelt friendship we greet you and we say to you : until next time. I Am Magatha of Agartha.